The centrepiece of a stylish garden is a beautiful lawn. You want your lawn to be the right size, have the best grass and be free of any pesky weeds. Fresh grass makes your whole backyard area look lovely and clean, so keep it well maintained. Here are the things you want to do to get the best-looking lawn possible. Grass for your lawn can come in many species. To make your garden aesthetic, you will want the best quality of fresh, green grass. Depending on the kind of garden that came with your home, you might have grass already. 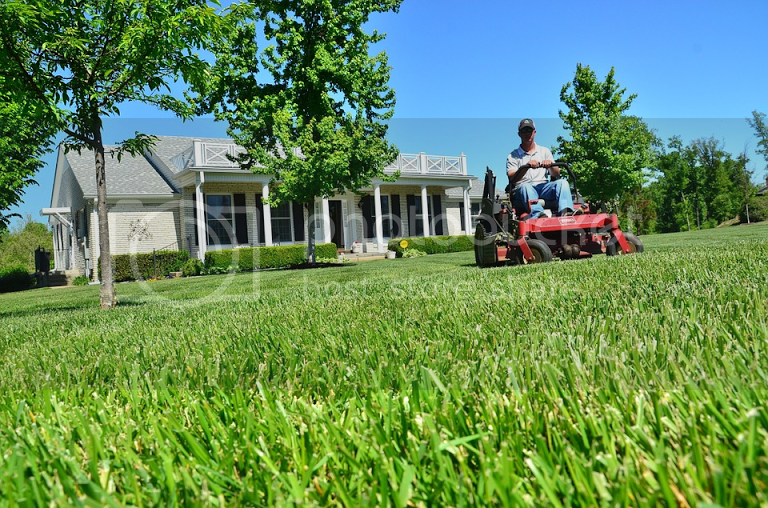 A lawn care service can let you know what kind of grass you have and what difference it makes. For the most part, though, grass is grass and the fundamentals of maintaining it remain the same. You might have patches of soil where you need to install grass. There are two ways to go about this- seed or sod. Using seed can take some patience and care to grow. Sod refers to real patches of grass that come pre-rolled ready to install. This takes much less time and is easy if you have an expert do the job for you. You could also go over your lawn with a lawn roller to turn it into soil if you want to install new grass. If all you have is concrete, you’ll need to install about seven inches of topsoil. Artificial grass is a simpler alternative, but you don’t get nice, organic grass. A good lawn needs a healthy diet of sun, water and fertilization. Fertilizer gives grass the nutrients needed to grow healthy and green. You’ll generally want to fertilize your grass at least three times a year for the best quality. The times you should fertilise depend on your type of grass. You can buy fertilizer in stores to feed it yourself, but you might want a gardening professional to take a look and fertilize it for you. Of course, you’ll want to mow your lawn whenever it gets out of hand. Regular hand push mowers are fine for smaller lawns. If you have a lot of acres, you might want a riding lawn mower. These days, you can even get robotic lawn mowers to handle the work for you! Your lawn should be mowed often, but don’t overdo it. Medium-long grass can sometimes look the best without being too problematic. You never want it to get too long, though. This can attract weeds and unwanted insects. You don’t want your lawn to be ruined by ugly, unwanted weeds. To keep your lawn clean, you’ll want to weed it out. This can involve pulling them out yourself, but there are easier ways around it. There are many methods to eliminate weeds from your garden. Using certain tools and chemicals can get the problem out, or even prevent them from growing in the first place. You can also make use of a gardener or landscaper who will know what to get rid of and how to do it. This is the finishing touch to having a fresh, healthy and green lawn. Having your lawn properly maintained will not just give you a cosmetic benefit but greener and healthier environment as well.
. Our cheap yard signs will exhibit your messages at charity events, parking entrances, tradeshows, conferences, clubs, and religious venues. Being the instruction and guiding billboard for your business, cause, or brand, they will help you reach the potential clients. It is best article and your post is helpful for all. Maximo Siems recently posted..Hello world! HI Fran you post extremely helpful data about green yard.I will try it. David Ramos recently posted..Hello world! People get some healthy tips in your article.Thanks for your important post. Jc mereles recently posted..Hello world! It is absolutely true that your garden should be neat and clean because it gives a new appearance to your garden.So all tips are really helpful in order to make your garden healthy and clean. take care of years as a consequence of a nasty experience as a baby. Hello Fran, you have shared very useful information about how we can make our garden beautiful with maintaining a healthy and green lawn. I will definitely follow these all points for my garden. But not everybody was sexually abused and never everyone needs to enter bodybuilding. These are some good pointers! Watering your lawn is really important, too, if you live somewhere that’s dry and doesn’t get much precipitation. Nicely said! Thanks so much for the helpful tips!